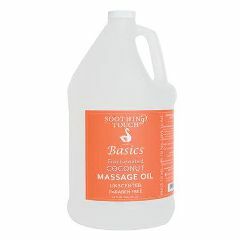 Soothing Touch Basics Fractionated Coconut Oil has been through hydrolysis then steam distilled to remove long chain triglycerides. The end result is an oil with very stable characteristics that is easy to use and store. The coconut oil is very moisturizing while being light on the skin with excellent glide and no greasy residue. Blends well with essential oils. Unscented, Paraben Free and Antioxidant rich.